The men and women who defend our country make sacrifices beyond measure. For the extraordinary level of service that puts their lives on the line, I know I owe them gratitude, but I often wonder about how to express that gratitude appropriately. “Thank you for your service,” is nice, but I’d like to do more. Two of my Weber colleagues had the same motivation in mind when they were in New York City several years ago during Fleet Week, an annual event when Navy and Coast Guard ships from all over the world dock in New York Harbor. Susan Maruyama and John McCann were having burgers and beers in a bar when a high-ranking general walked in with an impressive group of Marines. Talking with the general, they learned what a true grilling fanatic he was and how often Marines turned to the relaxation of grilling between intense periods of dangerous work. Susan and John got to thinking that Weber could demonstrate its support by sponsoring a nationwide grilling competition among Marines, to see who could grill the greatest steak in the land. The finalists from ten military bases would be flown to New York City during Fleet Week 2006 to grill in the middle of Times Square in front of millions of people watching live on Good Morning America. Weber also came up with the idea of publishing a cookbook based on the finest Marine recipes and steak recipes from famous former Marines as well, including boxer Ken Norton, golfer Lee Trevino, and pitcher Tom Seaver. The cookbook was a great success, in large part because it had so many fantastic recipes, but in the end, only one recipe could be declared the big winner. That was the Ooh-Rah Combat Steak, courtesy of Colonel Stewart Navarre from Camp Pendleton in California. I was one of the fortunate people to judge the final steak competition in Times Square, and so I can tell you that Colonel Navarre really nailed it. He served tender slices of glistening steak with seared garlicy mushrooms finished with crumbled blue cheese and a buttery red wine sauce. Ooo-rah indeed! If you would like to try his recipe yourself, you can get it right here. 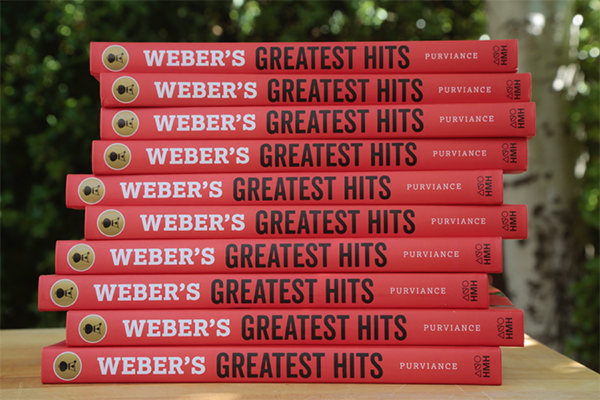 We have also included it in our brand-new cookbook, Weber’s Greatest Hits, a collection of the 125 top-rated recipes ever developed for Weber. From a pool of more than 2,500 recipes that I and others have developed over the past couple of decades, Weber fans helped us choose the very best, because sometimes nothing but the best will do. I hope you will enjoy the favorite recipes in our new cookbook, along with some amusing Weber stories about how this American brand became a worldwide sensation. As you gather with friends and family for Memorial Day and other holidays, please join us as we salute the men and women who have stepped up to serve our country.